Those of the older Baby Boomer generation may recall Robert the Robot (those of a younger generation may associate him with CBeebies, but that’s a young, upstart version). The 1950s Robert the Robot was the first plastic robot toy made in the USA. In reality, he was just a 14 inch tall plastic toy who could utter a few robotic phrases, do the usual robot whirling round (courtesy of the tethered remote control) and, excitingly, grip objects in his mechanical arms. Today though, we’re a bit more exercised about robots not as toys but as machines, increasingly clever machines at that, who (if robots are ‘who’? ), not might, but will take our jobs in the future. How near that future is depends on your line of work. If you were working on an automotive plant line then that future has already happened to some extent. If you’re a journalist, accountant or surgeon, you are aware that the robots are here already but that they are not going to take you job just yet, although it’s only a matter of time. However, while I’m not saying that this won’t happen, let’s get a sense of perspective. The news that a self-driving car has, sadly, killed someone, shows that there is some way to go before we can all sit back with a pina colada while a computer/robot steers us to our next meeting. Never mind the fact that ordinary cars kill thousands of people every year, one death from a robot is too many (especially if you remember the famous Isaac Asimov three laws of robotics). On top of this, it’s instructive to look at the BBC’s continuing series of videos/articles in which they show us some of the cool things that robots are currently doing. These range from mixing cocktails to playing Scrabble and moving chess-pieces to (in conjunction with a 3D printer) starting to build a house. The last one is particularly interesting because it’s in the repetition of manual tasks that robots excel. There are already bricklaying machines/robots and in the near future I can see technological redundancies amongst a lot of construction industry trades. However, although robots can walk and do quite a lot of the physical activities we take for granted, they are still some way off fully mimicking human body movements. 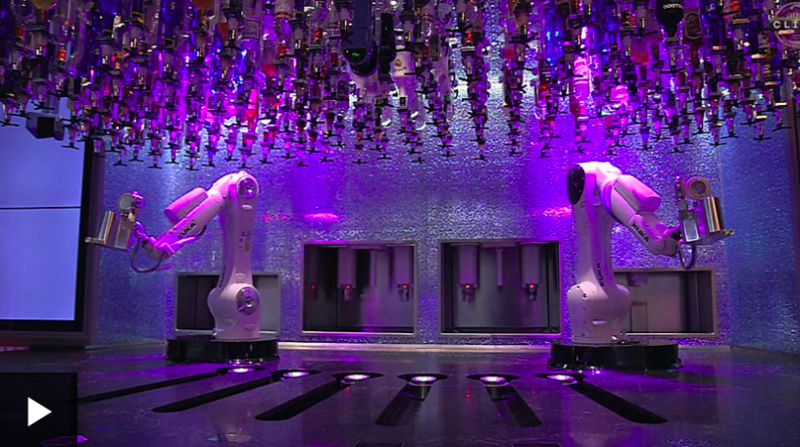 Also, to return the cocktail making robot arms, as you can see in the screenshot from the BBC video above, they are dependent on having optics of all the various cocktail ingredients screwed into the ceiling above. What happens when one of these bottles gets empty? I rather suspect that there will be many jobs that robots can do perfectly well but which we’ll just prefer to keep employing humans, with all our foibles, because, let’s face it, if you’re the only person at the bar it’s nice to have someone to talk to about the weather/football/television.